A little sewing, a little moving and a lot of OCD kicking in, this month. It's Fresh Sewing Day , and how is that even possible.....where did January go?? I think I ask that every month. I put it all together and then took it all apart.....more than a few times. I treat my house like one big design wall. Then I move things around...again and again and again. I'm not sure if I'm artistic or have OCD.....because once I start I can't stop. I need to start doing a little more sewing and a lot less moving. If you have time, be sure to stop at Lily's Quilts and see what everyone was up to in January. All that quilting makes me think of a city--in fabric! Yes, I vote for more sewing, your sewing is wonderful! I am sure that your place looks great too. 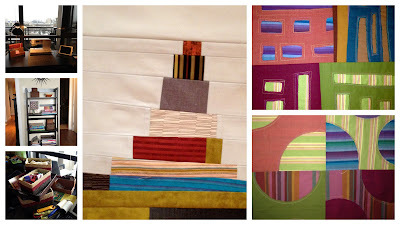 Your quilts are amazing, a real work of art - by all means - more sewing! I'm loving the new ditties on the right in your mosaic. Nice geometrics coming out.